When first released, Flipboard felt like it was born for the iPad. The app began life by culling links from your Facebook and Twitter timelines, presenting them in a magazine-inspired layout, driven by excellent design: You could feel the pages of turning as you swiped with your finger. Over time, the app’s focus broadened; it could display content from all sorts of sources, including major publications. 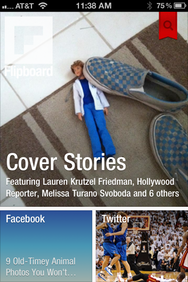 In its latest iteration, Flipboard for the first time became available on the iPhone and iPod touch as well. In addition to slimming down a bit to fit that smaller device’s screen, the app scored some new features, to boot. Not too long ago, Flipboard introduced accounts. Those accounts serve two purposes: Multiple folks sharing a single iOS device could each create a unique Flipboard account, giving each individual access to his or her preferred content sources. That way, you can choose to see stories from Rolling Stone and The Hollywood Reporter, while your roommate can focus on Vanity Fair and The Onion. Benefit two: Your Flipboard settings carry over seamlessly between different iOS devices. You'll Flip: Flipping pages in Flipboard on the iPhone works vertically, so folks coming from the iPad version may need a period of adjustment. Thus, the moment I loggoed into Flipboard on my iPhone, all my old content sources were there. Flipboard on the iPhone is clearly the same app as the iPad version, but the app’s designers cleverly reoriented things a bit to make the app fit better on the smaller screen. The most obvious difference is in the flipping itself: On the iPad, you swipe horizontally to flip between pages; on the iPhone, pages swipe vertically instead. Most of the time, it feels natural, but I’ll admit that on occasion I mistakenly try to swipe horizontally first—blame plenty of time spent using the iPad version of the app. In general, though, swiping through articles feels natural, like flipping pages in a top-spiral notebook. Much of the Flipboard’s navigation is similarly intuitive—adding sources, browsing articles, even marking tweets as favorites or commenting on Facebook posts. Cover Me: Flipboard's new Cover Stories feature attempts to assemble the most interesting or popular stories across all your content sources. New to Flipboard on both size iOS screens is a feature called Cover Stories. It’s meant to assemble the best or most interesting stories currently available across all your sources for quicker browsing. I’m not a huge fan of the feature—I prefer browsing the specific sources that capture my current interest—but I appreciate its appeal. I have but a trio of complaints about the iPhone incarnation of Flipboard. With many sources, the app is able to present a Flipboard-formatted version of the content; as with Instapaper or Safari Reader mode, it’s a reading-friendly layout. But flipping through iPhone screen-sized pages of lengthier articles feels odd; there’s not always a way to visually assess how far into the text you are—or how much text is left. Sometimes, stories show page numbers (like 1 of 7). Too often, however, the total number of pages isn’t displayed. Reading a lengthier missive from Vanity Fair in this fashion isn’t ideal. I’d prefer a more traditional scroll bar as I swiped through. In fact, that’s just what you get when Flipboard can’t offer an “optimized” view of the article, since you instead see the article in its native habitat as an embedded Web view. 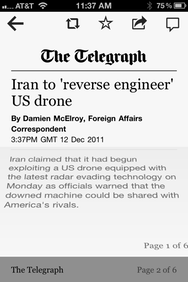 My second complaint is even more minor: I couldn’t find the Read Later button I longed to tap on some longer articles. Eventually, I learned that you first need to go to Flipboard’s settings and configure a service (either Instappaer or Read It Later) before the option shows up. Many apps take the approach of showing such buttons even before you configure the services, prompting you to log in to your service of choice when you first try the button. Had a friendly Twitter follower not pointed me in the right direction, I don’t know how long it would have taken me to discover Flipboard’s Instapaper support. And my final complaint: When you peruse new sources—and wow, Flipboard offers just oodles of great sources—the app takes you back to the wrong screen if you choose to tap the Back button; you need a second tap to get back to the list of available feeds to add. Minor grievances aside, Flipboard remains excellent. I don’t use it as an RSS reader, Facebook reader, or Twitter reader, though it certainly encompasses elements of all three. My daily reading regimen on my iOS devices starts with my RSS and Twitter feeds, and I use Flipboard for lighter reading. The app performs superbly in that role.